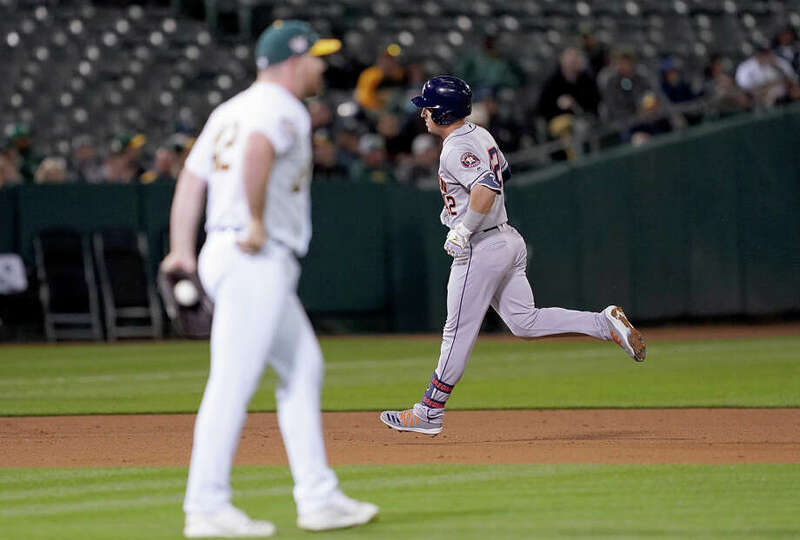 Alex Bregman #2 of the Houston Astros trots around the bases after hitting a grand slam home run off of Liam Hendriks #16 of the Oakland Athletics in the top of the fourth inning of a Major League Baseball game at Oakland-Alameda County Coliseum on April 16, 2019 in Oakland, California. All uniformed players and coaches are wearing number 42 in honor of Jackie Robinson Day. OAKLAND, Calif. (AP) — Collin McHugh has had a few close calls on the mound — nothing like this line drive he somehow dodged with an acrobatic maneuver that allowed the Astros to turn a nifty double play behind him. The ball hit by Kendrys Morales in the second inning of Houston's 9-1 win against the Athletics on Tuesday night skimmed in front of McHugh's face as his body bent backward and went parallel to the ground, reminiscent to the old Limbo dance. The ball touched the tip of the pitcher's ring finger, a much better option than his head or jaw — "probably the best place it could have hit me." "I saw the ball come off the bat but I was in a weird fielding position so I kind of like whiffed on it with my glove and then by that time I was just already falling over so it was like, I just kept going and the ball just kept tracking," McHugh said. "It would have tested how strong my jaw is for sure. Thankfully we were able to get a double play out of it. Routine, just how you draw it up. ... I don't know if it gets much closer than that." Alex Bregman hit a grand slam and Josh Reddick connected for a two-run homer against his former team in the Astros' majors-best 10th straight win. Bregman's second career grand slam gave McHugh (3-1) all the run support he needed on the way to winning his third straight start. Bregman's other slam came May 14, 2017, at the Yankees. "I'm hitting the softest .300 in baseball," Bregman said. "I need to start driving the baseball. It was a step in the right direction today." McHugh allowed two hits over six scoreless innings, struck out five and walked two. The A's avoided the shutout, getting a sacrifice fly from Morales in the ninth against Reymin Guduan. George Springer opened the game with a full-count drive. Reddick connected in the second inning following Yuli Gurriel's single for his first home run of the season. "It's always fun to come back, and to see how much I get booed," Reddick, with the A's from 2012-16, said before the game. Springer also had a leadoff homer April 1 at Texas. He drew a bases-loaded walk in the fourth that made it 4-0 before Bregman doubled that score. A's starter Marco Estrada (0-2) saw his career-high losing streak reach seven after losing his final five decisions of 2018 with Toronto. "That was really bad. I brought my worst game to a very good lineup," Estrada said. "Obviously that's not going to cut it. Can't go out there with missing the spots like I was today. Just not going to work against anybody." Reddick finished with three hits as Houston improved to 4-0 against the A's so far. The Astros have won eight of 10 in Oakland — and their 7-2 mark in 2018 at the Coliseum was the A's worst home record in the rivalry for one season. Estrada fell behind from the start on a night Nick Hundley earned a rare start catching the right-hander despite starter Josh Phegley's hot bat. Phegley, with his nine-game hitting streak, will be back in the lineup Wednesday. The A's whirlwind opening stretch has finally gotten a little easier. After opening the season in Japan last month and returning home, they just had their first true off day Monday following what was supposed to be 18 straight games before Saturday's rainout at Texas. Oakland gets another day off Thursday. Athletics: 1B Matt Olson, injured in the Japan series and nearing the one-month mark since undergoing right hand surgery, took his first swings with a fungo bat. The next progression in his rehab will be using a regular bat, followed by hitting off a tee. "It'll be a progression from this point, soft toss and tee, but I think we're right on schedule with him," manager Bob Melvin said. "I know he's pretty eager to start swinging a bat and face some pitching, but it's going to be a little bit more time before we do that." ... OF Nick Martini (sprained right knee) is doing baseball activities and will begin taking more live batting practice on the field. With April as World Autism Month, the A's on Tuesday unveiled a sensory room in one of the center-field suites. The quiet, peaceful space provides fans of all ages with autism, Down syndrome, post-traumatic stress disorder, dementia or other conditions a calming and soothing spot where they can deal with sensory issues. Astros: LHP Wade Miley (1-1, 3.45 ERA) is 5-1 with a 1.40 ERA with 26 strikeouts and 17 walks in six career starts vs. the A's. Athletics: RHP Frankie Montas (2-1, 3.18) took the loss April 5 at Houston, but is coming off a 10-3 win at Baltimore last Wednesday.